My article about Gooler, the country fig or the Indian fig was published in Down to Earth magazine. I am posting the detailed version of the article, the magazine article was a downsized version of all the research I did with gooler and it's properties. I remember my grandmother telling us bedtime stories and taking us to unknown lands of fantasy. Her stories involved birds, jungle animals, trees and their conversations and we grew up considering these ‘characters’ as our companions. One of the stories that stuck in my mind was when she told about Gooler ke phool ( Fig flowers) in a story, that these flowers are seen by rare lucky people and whoever is able to see Gooler ke phool finds a treasure or a lost kingdom. This story stayed with me in my childhood and I often enquired the wild fig trees around to find a flower. No wonder I could never be lucky, I came to know later when I studied inflorescences in my biology class much later. The small figs we saw on the trees were actually inflorescences (cluster of flowers) and this special type of closed inflorescence is called as Syconium. 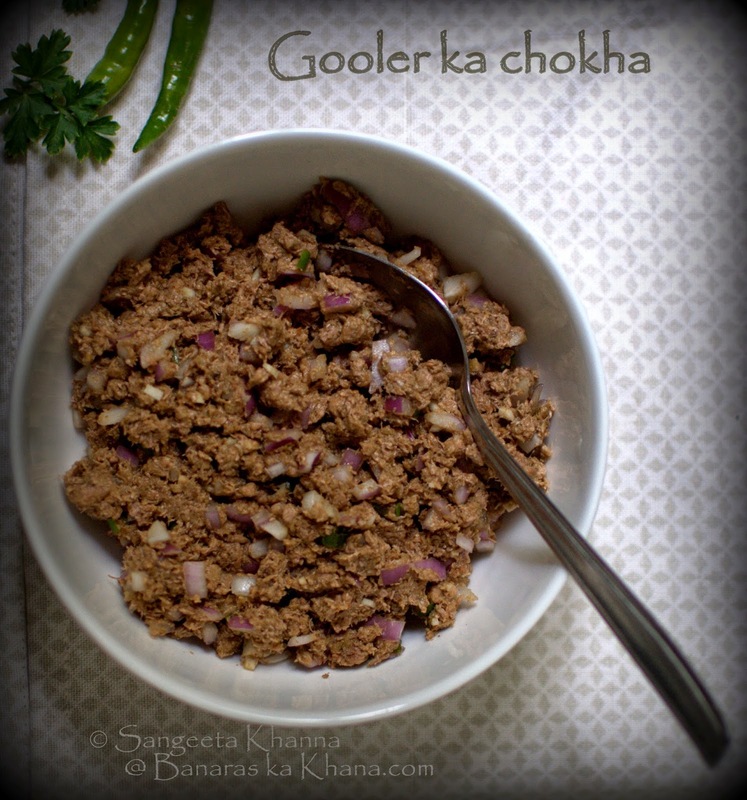 There are more reasons why I associate Gooler with my grandmother, she relished Gooler as food and introduced us with the ways it can be eaten. In the last few years we have seen the fresh plump ripe figs appearing in the upmarket stores, the fruit being sold at a premium price as it is deemed exotic. These fresh figs are the Ficus carica species, this fleshy variety of figs is either imported or grown as exotic fruit only in a few places in India, one variety grown around Maharashtra is called 'Poona figs' (ref. Handbook of Indian Agriculture). This fruit variety is highly perishable and hence most of the produce is dehydrated to form discs that can be re hydrated and used as required. Many of us have been relishing these figs in the dehydrated form called sookhe anjeer, those flattened and dried sweet discs filled with crunchy seeds and chewy dry flesh. Many 'sugar free' desserts including the kulfi and ice creams use sookhe anjeer. Most of us have forgotten the smaller, more common variety of figs that grows wild all over India and is seen on roadsides or along old buildings. This one is called cluster fig or country fig, Ficus racemosa is the small Indian fig that is equally nourishing as the fruit fig. Goolar is the more common name it is known as in north India. 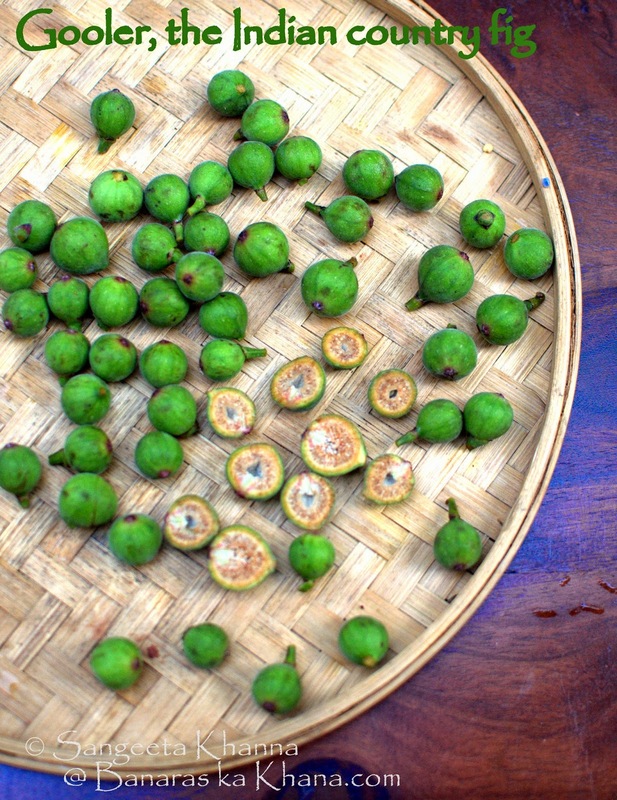 The fruits are loved by Macaques, Squirrels and most birds, particularly Barbets, Tree pies and Parakeets and that is how the seeds get dispersed and this fig variety propagates easily. The last time I had the fortune of tasting Goolar ki subzi was a couple of years ago when I was visiting Banaras. 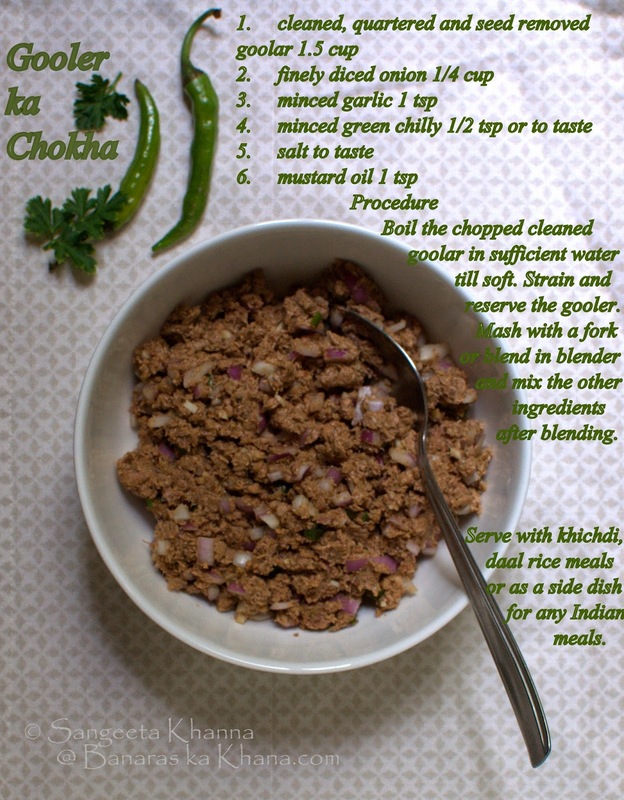 The spicy meaty Goolar ki subzi has been a family favourite and my mother had cooked that for us. We miss Goolar here in Delhi though we see it growing around our colony. Goolar is a great shade tree, home to my favourite birds but the fruits were never accessible somehow, this time I asked the gardener to bring me some and he obliged. I cooked chokha and kababs first and then pickled a few for the first time. 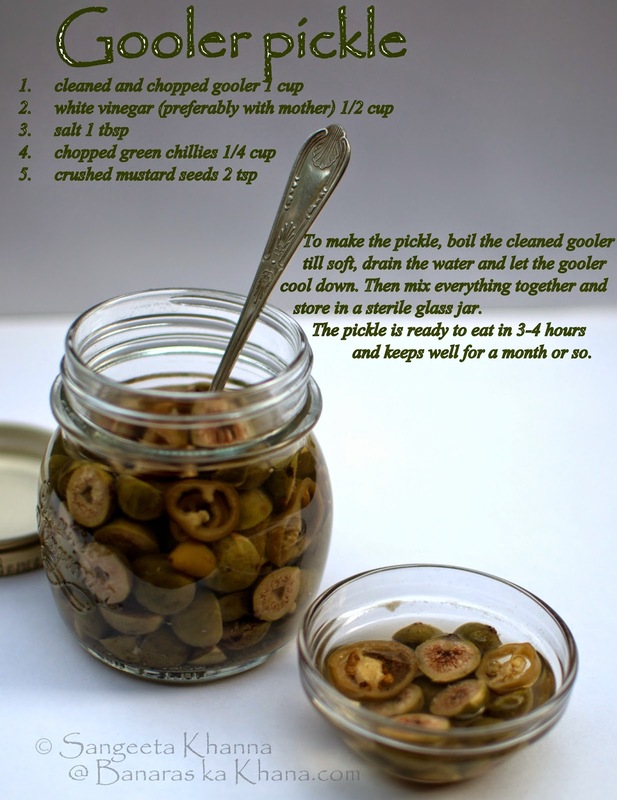 The pickle is doubly nourishing as it gets some probiotic flora along with the naturally occurring prebiotic fiber. Considered as cooling, blood purifying, anti inflammatory and healing by Ayurveda practitioners, the raw fruits are valued as a tasty and healthy vegetable. The fruits contain tannins and the soluble and insoluble fiber found in the fruit is prebiotic in nature. That is the reason the raw fruit used as a vegetable was considered extremely good for stomach ailments. I remember my grandmother who lived a healthy and active 105 years, always brought some goolar whenever she had upset stomach. She would make goolar ka chokha mostly but she loved the spicy meaty curry made using goolar as well. People of her generation knew what to eat day to day ailments. The goolar ka chokha is considered cooling during summer months, a raita mixed with buttermilk is cooling too and highly recommended for stomach upset caused due to amebeosis. Interestingly, goolar was never cultivated as vegetable or fruit but the abundant bunches of fruits were foraged during harsh summers and beginning of monsoons when the green vegetables would become scarce in the olden days. Ripe fruits used to be plucked by children as they are quite attractive and aromatic, some children would eat the fruits but the taste is not as good, so most of the ripe fruit would get wasted. Raw fruits are actually an inverted flower filled with stigma and stamens and hundreds of insects that pollinate this closed inflorescence called Syconium. These insects would complete their life cycle till the fruit is ripe and would escape leaving the ripe fruit empty. This is a great example of symbiosis between a fruit and insect. To cook the raw goolar, one has to cut them in quarters, clean the interiors of all the fibrous floral parts and the insects and the fleshy envelope of the fruit will be parboiled and then either curried or mashed to make bharta or chokha. Many vegetable vendors would collect the goolar from nearby jungles and sell them to earn some profit, there was always a demand for goolar as folks knew it is good for health. Even dehydrated raw goolarwould be stored, its powder was used with sugar candy to cure E. coli infection. The fresh milky discharge (latex) from the leaves is considered healing for epidermal wounds when applied 3-4 times a day, it helps many kinds of infections of the skin (source). The enzyme ficin present in the fig latex is responsible for its anthelmintic activity and can be given with great benefit in worm infestations especially ascaris and tricharus types (source). Apart from the usage in traditional medicine, scientific studies indicate F. racemosa to posses various biological effects such as hepatoprotective, chemopreventive, antidiabetic, anti inflammatory, antipyretic, antitussive and antidiuretic (source). 1. Boil the chopped cleaned goolar in sufficient water till soft. Strain and reserve the gooler. 2. Mash with a fork or blend in blender and mix the other ingredients after blending. 3. 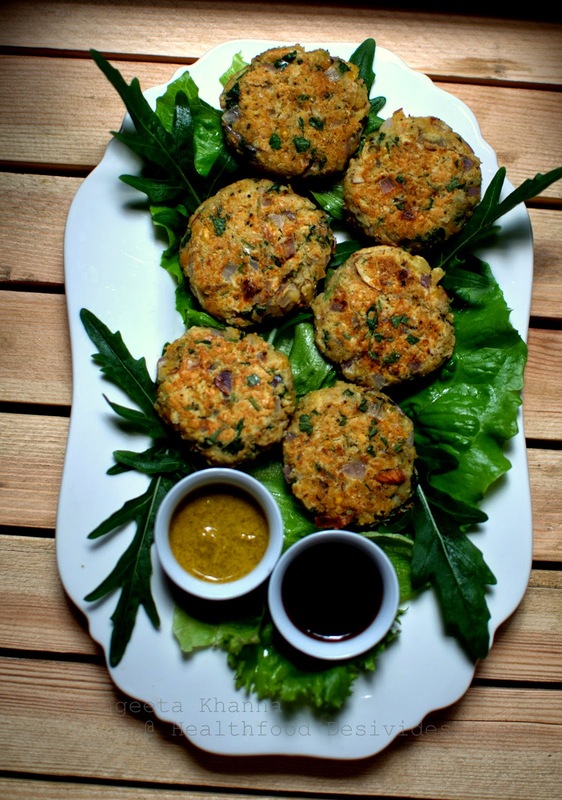 Serve with khichdi, daal rice meals or as a side dish for any Indian meals. 1. Boil the cleaned gooler in sufficient water till soft, drain and cool. 2. Mash with other ingredients except ghee to make a dough like mixture. 3. Shape lime sized balls and flatten them between the palm. Arrange to be shallow fried in batches. 4. Shallow fry using ghee or any oil of choice. Serve hot with green chutney or tamarind chutney. To make the pickle, boil the cleaned gooler till soft, drain the water and let the gooler cool down. Then mix everything together and store in a sterile glass jar. The pickle is ready to eat in 3-4 hours and keeps well for a month or so. Dear Sangeeta Khanna, thanks for sharing this.My grandmother used to cook goolar ki sabji, which was my father's favorite dish as well as mine too. I miss that taste. I found out that tree in NSIC Exhibition compound in Okhala in Delhi. 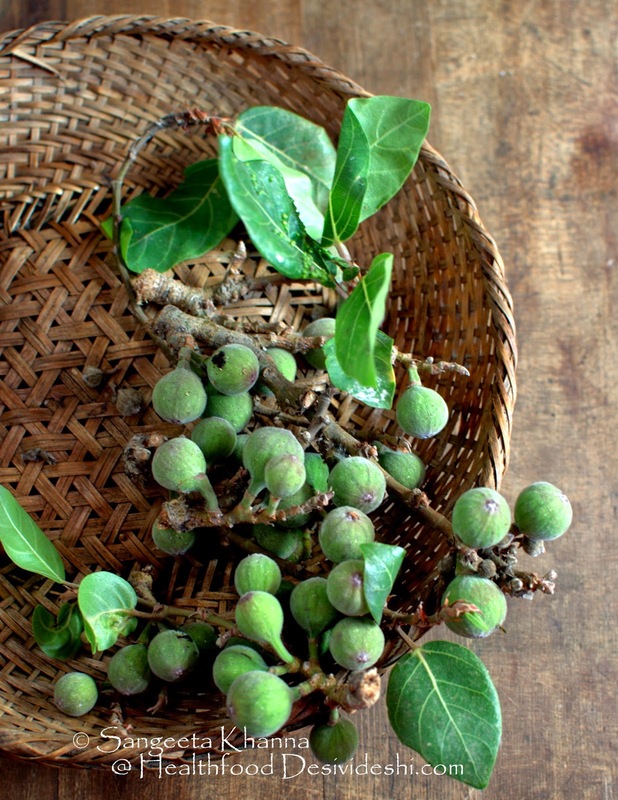 I am very happy to know that there are some people other than me have not forget their Grandma recipes.I have found out the tree here in North Goa as well, but no one here knows about the benefits of cluster fig. I wish to preserve all that rare trees I haven't seen since my childhood. Hi Prashansa, so glad to hear from and that you love gooler as much as I do. My work seems worth when it helps preserve the lost foods. Thank you so much for writing in.